LICENSING: Remember, a scooter is a motor vehicle. Aside from a couple of notable exceptions (see below), laws in U.S. states and Canadian provinces require you to have a driver’s license, and your bike to have a license plate. Whether or not you will need a motorcycle endorsement depends on where you live. In the state of Washington, a motorcycle endorsement is required to ride any scooter or motorcycle with an engine displacing 50 or more cubic centimeters; in Illinois, the cutoff is 150cc. The exception: the U.S. state of Nevada. If your scooter has a 50cc engine, you don’ need no steenking operator’s license, license plate or insurance. As a friend observed, in this case the law treats a 50 like a bicycle. Your state or provincial motor vehicle agency is the best source of information on what’s required. Ditto for anywhere outside the U.S. or Canada. HELMETS: Helmet laws vary wildly from state to state. Helmets are required in Washington and Oregon, for everybody. In Florida, you don’t have to wear a helmet if you can prove you have at least $10,000 in medical insurance. These days, 10 grand barely pays for a funeral, never mind treatment of a head injury, but hey. Many states only require helmets for riders under 18. Illinois, Iowa and New Hampshire don’t address the subject at all(!). I dunno, I can’t imagine riding anywhere without strapping on a brain bucket. What kind is a personal choice, but you should keep this fact in mind: a helmet cannot protect any part of your head it does not cover. The Snell Memorial Foundation is an organization that tests helmets rigorously and issues standards that greatly exceed those of the U.S. Department of Transportation. Snell-certified helmets are required by nearly all motorsports sanctioning bodies. A half helmet (aka “piss pot”) cannot, and will not meet the Snell standard, no way, no how. Personally, I think such helmets are as bad, if not worse, than wearing no helmet at all. But they can meet U.S. DOT standards, unlike the snowboarding, kayaking and bicycle helmets I occasionally see scooter riders wearing. A proper motorcycle helmet (there’s no such thing as a “scooter helmet”) will say “DOT” on the back (or “ECE” outside the U.S. and Canada), and will say “Snell 20XX” depending on which Snell standard it meets (new standards are issued every five years). A helmet is no place to scrimp; get the best one you can afford, and figure on getting a new one every 3-5 years. OTHER PROTECTION: Some will call me a heretic, but I think dressing head to toe in Hi-Viz yellow armored clothing to go a couple miles to the grocery store is, frankly, stupid. You’ll notice in all the classic photos of Vespas that the riders are not only not wearing protective clothing, they’re not even wearing helmets. The design brief for the original Vespa called for a device that could be ridden by someone wearing normal clothing. If I were to make the same trip on a bicycle, I could be wearing my 3 micron-thick spandex Tour de France outfit (no underpants!) and no one would think anything was wrong. But I would be riding on the same road, at the same speed, whether on the bicycle or the Vespa. That’s the point; I use the scooter for trips where a car is too much vehicle. On longer and/or faster trips, I wear a Corazzo 5.0 armored jacket and thick jeans (yes I do need to get some leg armor). The point is to dress appropriately for the trip you plan to take. MOTORCYCLE SAFETY CLASS: Take one before you even think about buying a scooter. And take said class on a motorcycle. Even though the geared scooter is very much an endangered species, knowing how to shift for yourself, as it were, will do you good, even on a modern twist ‘n go scooter. Especially if you’re on a 50cc scoot; you are the smallest, most vulnerable motorized thing on the road. Self-preservation demands that you be able to mix it up with SUVs, buses and trucks (and, now that I think of it, crazy bicyclists) without flinching. In Washington, successful completion of an approved motorcycle safety class gets you a card that you can take to a driver licensing office and exchange (along with the requisite fee) for a 2-wheeled motorcycle endorsement (if your bike has a sidecar, or is a trike, that’s a different endorsement). The states and provinces all have different requirements, so check with your local motor vehicle authority. “VESPA WON’T START”: I could write a whole book about this, but someone already has: the Haynes Vespa P/PX-Series manual is, IMHO, the best one to have for your P or PX (as are all their other service manuals) because the Haynes people get an example of the vehicle covered by the book, pull it apart and put it back together, and take lots of pictures in the process. They also offer insights along the lines of, “the widget is behind the frammus, which must be removed in order to access the clevis bushing.” The book has a whole section devoted to troubleshooting. Another nice publication to have (especially since you can download a .pdf by clicking on the link) is the Stella Service Station Manual (25.1MB pdf). Except for the engines, PXs and Stellas differ only in the details, so if you are working on a P or PX you can get an even better idea what’s what, because the Stella book has more pictures. And torque specs. If you have a modern Vespa, see ebooksquad above, though the hard-copy service manual is not particularly expensive (check with Scooter West or Scooterworks). Even if you never pick up a wrench, an evening spent perusing the service manual will pay dividends in knowledge of how your scooter works, which will make you a better rider. “CHANGE OIL IN VESPA PX”: If you have an old-skool 2-stroke scooter, you change the gearbox oil; you don’t change the engine oil, because the engine burns it. That’s how 2-stroke engines work. And no, you DO NOT use motor oil for a car or 4-stroke motorcycle engine. Most 2-stroke oils say “2T” on the label. Initially I questioned paying upwards of 13 bucks a liter for synthetic 2-stroke oil when the local big-box store had mineral-based oils by the likes of Texaco and Valvoline for three dollars. But I found the PX ran noticeably better on the synth oil, and folks who work on scooters say the synth results in less carbonization in the cylinder, which could put off the inevitable engine rebuild you should plan on doing sometime after 30,000 miles. I like Motul 710, but Si-7 has its adherents, and I’m sure there are others that are equally good. Whatever oil you use should meet the American Petroleum Institute’s TC standard (look for “TC” on the container). I could generally go 900-1000 miles per liter before the little white thing in the oil sightglass appears. The GTS, being powered by a 4-stroke engine, requires an oil and filter change at intervals specified in the owner’s and service manuals. Use a full-synthetic (e.g., Castrol Syntec, Mobil 1, Red Line) motor oil of weight recommended in the manual, which at this time is 5W-40. 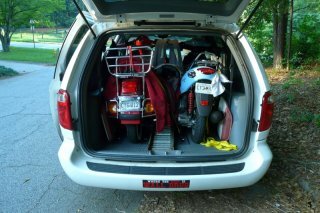 “WILL SCOOTER FIT IN MINIVAN”: The picture on the right is from Amerivespa 2008 in Chattanooga, Tenn. Notice there are not one, but two scooters stuffed into what I suspect is a Dodge Grand Caravan. The scooters in question are a Stella and a Buddy. If you’re a regular viewer of Scoot.net’s photo gallery, you’ve probably seen lots of Honda Elements with vintage scooters in them. So yes, it can be done, but whether you can do it in your vehicle is going to require you to get a tape measure and and check not only the length of your bike, but the length of the load space. Keep in mind, you might need a bit of extra space to load/unload/position your scooter. And be sure all doors can close properly once the bike is on board. If you’re shopping for a scooter hauler, you need to look closely at the Ford Transit Connect. Or the Nissan NV200 Compact Cargo. “IT’S NOT A @#$% MOPED!” There is a great deal of confusion about scooters vs. mopeds. Moped is short for “motorized pedicycle,” i.e., something with pedals like a bicycle and an engine like a scooter or motorcycle. The state of Washington defines a moped in RCW 46.04.304. The law was recently changed to remove language that said a moped needed pedals and other bicycle accoutrements. In fact, the Washington law is now closer to Oregon’s. Lots of 50cc scooters are restricted to a top speed of 30 mph so they can be registered as mopeds in some states. Often, de-restricting them is very easy. But you didn’t hear that from me, okay? A moped often gets cheap registration (and in some cases, a special license plate) and exemption from some laws pertaining to scooters and motorcycles. But a Honda Hobbit is not a scooter; a Vespa PX150 is not a moped. Legally, it’s not a scooter, either—most places call it a Class 1 motorcycle. A Suzuki Burgman 650 is most definitely not a moped. SCOOTER CARBON FOOTPRINT: When this was written, my vehicle fleet consisted of one 2005 Vespa PX 150, one 2005 Ford Escape XLT 4WD, and one 2007 Vespa GTS 250i.e. I had primarily gotten around on the PX, saving the Escape for those occasions when I needed more vehicle (or, I’m not ashamed to admit, just didn’t feel like riding in crappy weather). The PX got about 72 mpg, the Escape about 20. Let’s assume burning one gallon of gasoline produces 20 lbs of CO2 (there doesn’t seem to be any agreement on this figure; it ranges from 20-25 lbs). Of course, a higher figure for CO2 emissions would mean a larger saving. A saving that is quantifiable, verifiable, and occurs in real time. As opposed to something like Terrapass, where their Web site makes some rather vague pronouncements about the money you pay for carbon indulgences offsets funding projects that might result in reduced CO2 emissions. On the very first Earth Day in 1970, my 9th-grade homeroom class went to a lot near what is now Highland Middle School in Bellevue and planted some trees. By that summer, the lot had been bulldozed so a 7-Eleven could be built there. Our trees were killed and ended up in a landfill somewhere. There are lots of other places to buy carbon offsets that might not be as conscientious as Terrapass professes itself to be. So what you’re getting is the ability to rub others’ noses in maintain your green -ness cred and still take that flight to Peru, even though commercial aviation’s CO2 footprint is way bigger than personal transportation’s. Of course, one cannot go copping an attitude about being green when one rides a scooter powered by a 2-stroke engine. The Stella and PX were not available in California because they couldn’t be made to meet that state’s stricter emissions standards. But until such time as leaf blowers, chain saws and other devices powered by 2-stroke and uncontrolled 4-stroke engines (often poorly-maintained) are banned, I’m not interested in hearing how the relative handful of old-skool scooters are destroying the planet. ‘Cause they aren’t. I’d wanted a Vespa GTS ever since they came out; I finally got one in September, 2008. California emissions-certified, 75-80 mpg (your mileage may vary). Not to mention the cushy ride over Seattle’s gawdawful pavement. Then too, I live in a neighborhood where there are lots of stores, cafés and things to do within walking distance, which will really reduce your carbon footprint. If you are not comfortable riding alone, don’t ride in a pack. Beginners should stay in the back for safety. Don’t ride faster than you are comfortable riding. Keep to one side of the lane and ride in a staggered formation (never in the center of the lane), unless you are on a technically challenging road. In that case, you may need to ride single file to negotiate the corners (Chuckanut Drive is a good example). Know your hand signals and use them. The Motorcycle Safety Foundation has a handy fact sheet with illustrations and more. Hand signal all lane changes and lane position changes, stops, turns, etc. Keep an eye and ear out for scooters around you, don’t just use your mirrors. You can listen to your iPod later! Don’t tailgate or ride in peoples’ blind spots. If you hit someone from behind, it’s your fault. NO EXCUSES! Let people pass you, especially if someone is crowding you. Slow down, move to the right and drop back until they pass. It’s more important to keep the group properly spaced than to maintain your position in the group. Communicate breakdowns/lagged bikes to the leader. Ideally, someone in your group will ride in the “sweep” position at the back of the group. Stay with the pack and don’t create large gaps. Be cautious when passing others. It’s easy to accidentally cut someone off when passing. Also, don’t ride up close behind them before you pass—it’s really distracting. “WHAT DO YOU THINK OF (INSERT OFF-BRAND NAME HERE) SCOOTERS:” I usually get this question via e-mail (click the “Communicate” link; I love hearing from you). There are a heckuva lotta companies in the world building motor scooters, and quality varies wildly. My suggestion is to be a smart shopper and plug the name of the off-brand scoot you’re thinking about into your favorite search engine. Ditto for the company selling it. See what you come up with. Feel free to share your findings, but if what people are saying is mostly bad, look elsewhere. I realize some of you in the market for a scooter may only be familiar with Vespa and Piaggio. That’s why I suggest you go to a bricks-and-mortar dealer, preferably a well-established powersports dealership that handles multiple brands. The owners of such establishments realize you don’t stay in business long-term by screwing people over; they will want you to have a good experience with your new bike, and will do what they can to make that happen. Keep in mind, a mail-order/off-brand scooter can, in the words of Steve Guzman of The Scooter Scoop, be a perfectly reasonable purchase—if you’re MacGyver. Because if the thing breaks, you’re on your own. You will have to figure out what’s wrong and how to fix it. I totally understand, for lots of folks it’s about the wrenching, but I’d rather spend my time riding. OKAY THEN, WHAT BRANDS DO YOU SUGGEST? Vespa and Piaggio, of course! 🙂 The Piaggio Group also includes Aprilia and Moto Guzzi scooters and motorcycles; Piaggio Group scooters all use the same engines. Honda makes wonderful scooters, but American Honda has no interest in marketing them—your local dealer might have one or two in the back of the showroom. Yamaha has several scoots worth considering. Genuine Scooter Company’s Buddy is made by PGO in Taiwan, and one that I highly recommend, especially for riders of short stature (a manual-transmission Stella is a better choice for experienced and/or mechanically-inclined riders). Kymco has a large dealer network and a model lineup so extensive it’d be difficult NOT to find a scooter that’s just right for you (BTW, they sell engines to BMW). SYM is another Taiwanese company with excellent products. And at the risk of having a fatwa declared on me, I will say the Adly Lambretta, like all Adlys, is a well-made, well-engineered scooter that is popular and well-regarded in Europe, where it’s mostly sold under something other than the Lambretta name (not so easy to find in the U.S. these days, but often cheap when you do). I once recommended the Hammerhead La Vita, which is now out of production, but it turned out those have insoluble problems with the ECUs. And they’re hard to find in running condition, in any case. Too bad—a great concept executed badly. I will say again, no matter what brand you choose, buy your new scooter from a well-established, brick-and-mortar powersports dealer. Such dealers know the value of customer service and quality products. That’s how they stay in business.